A secret spans five generations from Cornwall to Australia. When Jenefer moves to the old family home in country Kapunda, she uncovers a secret from the past. What sort of life did Gweniver, her great-great-great-grandmother, lead? And what connection did she have to the glamorous young singer, Zenna Dare? Could a nineteenth-century mother of nine have led a double life, and, if so, why? 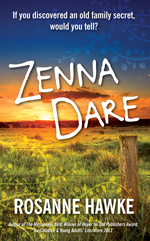 In a story crossing five generations, from the old world to the new, Zenna Dare brings reconciliation in more ways than Jenefer could ever have imagined.